The LaserLyte-Flex is an entry-level laser alignment system. It uses interchangeable optics and a semiconductor laser diode to project a highly visible dot, line, cross, or a combined line and central dot. This helps you to accurately align and position garments, cloth, paper, wood, and metal of different shapes and surface profiles. You don’t need previous laser experience to operate the LaserLyte-Flex. As a plug and play module, it is ready to use almost immediately saving you time, effort, and training resources. The LaserLyte-Flex is available in red (635, 650nm) and green (515nm) models. The green model emits light that appears more than 2X brighter to the human eye than the equivalent power in 635nm. As a result, you’re more likely to see these projections against dark materials, in high ambient light levels, or from long distances. A variety of interchangeable projection optics is available to allow you to quickly choose a pattern that suits the shape and surface profile of your target material. In addition to alignment and positioning, the option of a cross can also assist in laser targeting applications. 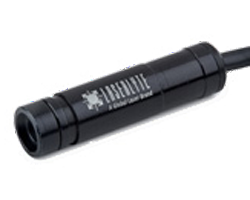 The LaserLyte-Flex system includes the laser diode module and an adjustable focus key. A choice of mains power supplies and extension leads are available as separate items. A comprehensive range of accessories including mounting clamps, rail systems, laser safety glasses and enhancement glasses are also available to complement the LaserLyte-Flex.